When you picture the black and yellow creatures that pollinate plants, you probably don’t think of a Husky do you? But that’s exactly what the team from West Virginia University is using for their current project – a Husky UGV, that is. After winning NASA’s Sample Robot Return Challenge in 2016, the researchers have continued to put the system to use, repurposing it for another use-case (one of the advantages of having an easily customized robot that runs on ROS). In a collaboration between mechanical, aerospace, computer science, electrical engineering and entomology, the Husky was outfitted with payloads that allow it to remotely pollinate blackberries. A variety of sensors, including a Kinova Jaco arm, Velodyne 3D lidar, and other vision payloads will allow the system to use methods of artificial intelligence such as deep learning and machine learning. 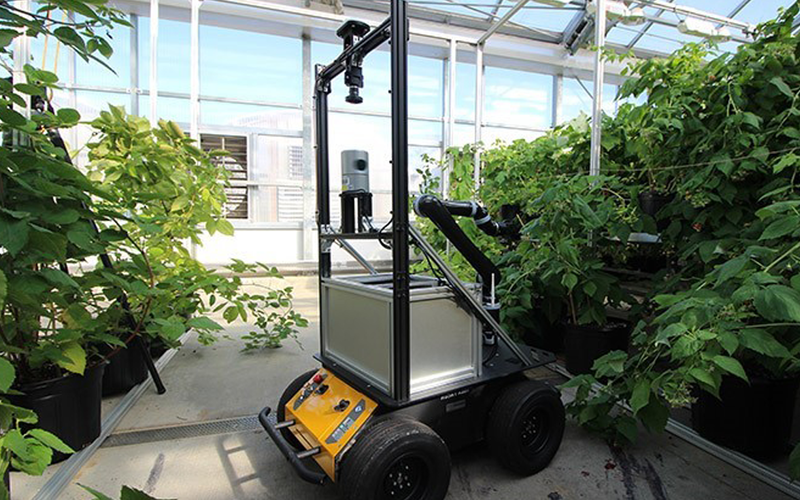 This will allow the robot to “recognize flowers by looking at flower size, position, age and other characteristics prior to pollination,” according to team horticulturist Dr. Nicole Waterland. Click the banner below to learn more about the Husky UGV – the outdoor mobile robot that is being used by research groups across dozens of fields of study.